This is a member of the family Rutaceae. 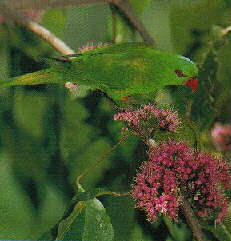 It occurs predominantly in coastal riverine rainforests, and flowers in summer. It is a highly ornamental tree popularly grown in parks and gardens. Scaly-breasted Lorikeets (above), other lorikeets and honeyeaters are attracted to the spectacular clusters of the fragrant, pinkish-mauve flowers of this plant. Many colourful butterflies are also attracted to flowers, including the spectacular Ulysses Butterfly, which utilizes the leaves as an important food source for its larvae.